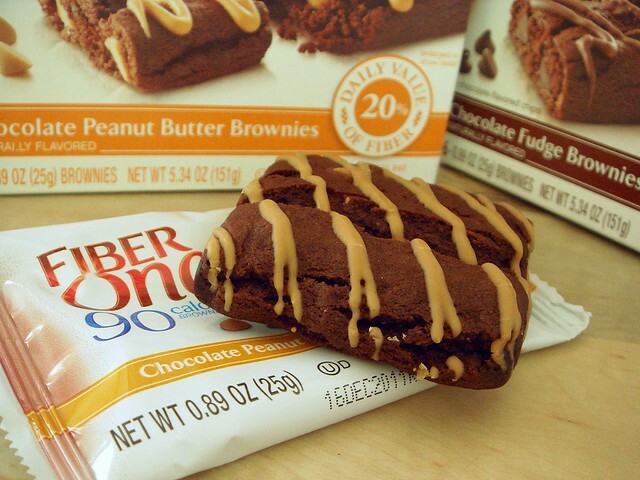 If you're looking for a sweet snack that won't break the bank, Fiber One has come out with a new line of 90 calorie snacks, this time in brownie form. The premise of the Fiber One line is in the name. Fiber helps keep you feeling full longer while keeping snack attacks away, and with 5 grams of fiber per bar, you get 20% of your daily fiber in the form of a delicious brownie. Each bar contains 90 calories, 5 grams of fiber, 3 grams of fat, 17 carbohydrates, and just 7 grams of sugar. It's a light snack, for sure, but it is tasty. 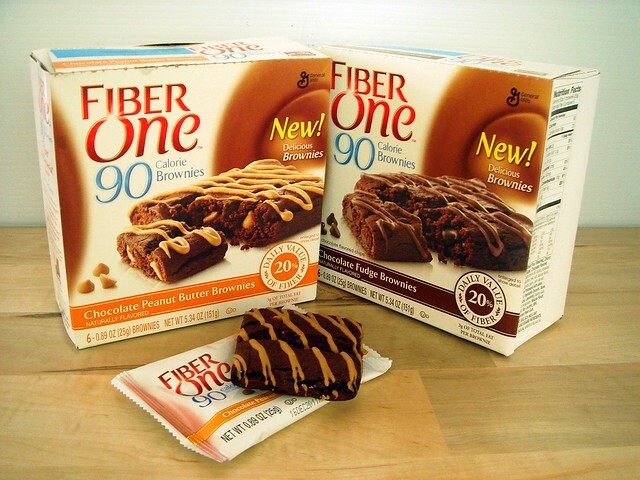 I was sent two boxes of Fiber One brownies, along with a fitness pack, from MyBlogSpark to review. The Chocolate Peanut Butter Brownie is my favorite. The peanut butter flavor comes from peanut butter chips and icing, and "partially defatted peanut flour". The peanut butter didn't overpower the chocolate in the brownies, which I liked. At times, the peanut butter tasted almost like caramel. The texture surprised me. I figured, based on how it looked, that the brownie would be more cakey than fudgy, but it landed somewhere in the middle. The Chocolate Fudge Brownie has a deep cocoa flavor that would be nice when eaten with a cup of coffee. Flavor wise, I like them both and while I typically stay away from reduced-calorie foods, in this case I'm happy because the sugar content has also been lowered. I wouldn't call this a natural bar. While there aren't many additives, there are a few thickening ingredients and other stuff not normally present in homemade baked goods or brands that use whole ingredients. It does make for a good snack on the run, though, especially if you're a fan of chocolate and peanut butter. Now, would you be interested in a giveaway? Along with the 90 calorie brownies, you'd also receive a fitness prize pack to aid your fitness goals. 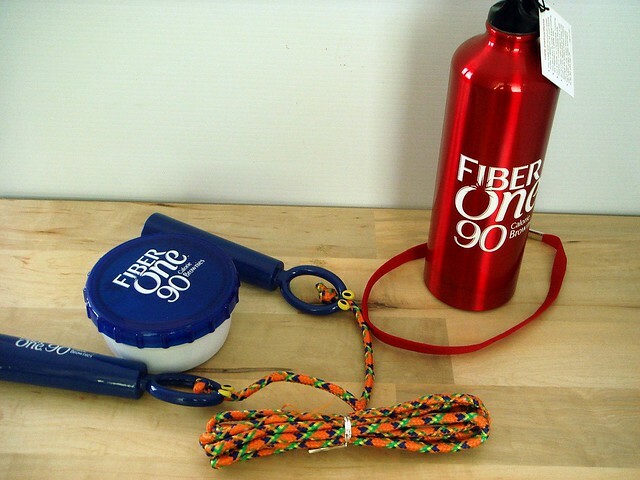 The prize pack contains a resuable water bottle, a jump rope, a headband, a fitness bag, a bracelet thing, and a nifty snack bowl with a freezable lid to keep foods chilled. Isn't that cool? Pop the bowl (or just the lid) in the freezer, then fill the bowl with your snack and screw the lid on when you're ready to leave. The lid contains a freezer-safe gel that turns to ice when frozen. I like it. Leave a comment and tell me what your favorite healthy snack food is. For a second entry, Tweet this giveaway and leave another comment with the link to your tweet. For a third entry, like She Runs, She Eats on Facebook if you haven't already done so. Comment again to let me know. And for one more chance to win, blog about this giveaway on your blog, linking to this post. Leave another comment. This gives you up to four chances to be entered into the giveaway. To be eligible, you must reside in the United States. Giveaway ends Wednesday, July 20 at noon. Winner will be posted after noon. Good luck! I need to be "partially defatted." Fave healthy snack right now are farmers market cherries. It's hard to pick just one. All kinds of fruit, chobani greek yogurt, string cheese... the list could go on! My favorite snacks are an apple with pb or almond butter, and Pure Bars! Love them! My favorite healthy snack is blueberries. Brownies that have extra fiber? SIGN ME UP! My favorite healthy snack is rasberries. Don't ask me to share! My favorite healthy snack is greek yogurt + some type of fresh fruit + honey + granola. Have it almost every afternoon. Sometimes I'll throw in some mini chocolate chips too (goes especially well with strawberries and/or blueberries). right now my fave healthy snack is fruit. My favorite snack is sunflower seeds and pepitas. I like your blog! YOu know, the Fiber One Chewy bars are ok too. Not natural at all, but tasty. My favorite healthy snacks are a mushroom salad and FiberOne chocolate fudge brownies! This is a another way on how to prepare your browni , another way to present your browni to your Family and friends, and how yummy it is, especially the peppermint.